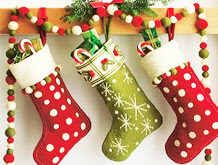 If you, like us, are normal, then you've healthily left all your present buying until the last moment, knowing that The Test Pit's sixth and final gift guide for kids will really nail down the whole series, completing your inspiration. And so, until next year baby, may we present several more choice cuts of toys and gifty goodness to bestow upon your bairns. Mezzy Chrizwoz! Combining LEGO with the Star Wars universe was probably the best thing that any human has achieved since pre-slicing loaves of bread. But, what happens when you combine both of those great things with the ability to see in the dark? Oh my God, the best stocking filler ever... the LEGO Han Solo Keylight. As you might have guessed, this oversized Minifigure represents the dashing rogue pilot of the Millennium Falcon, Han Solo. 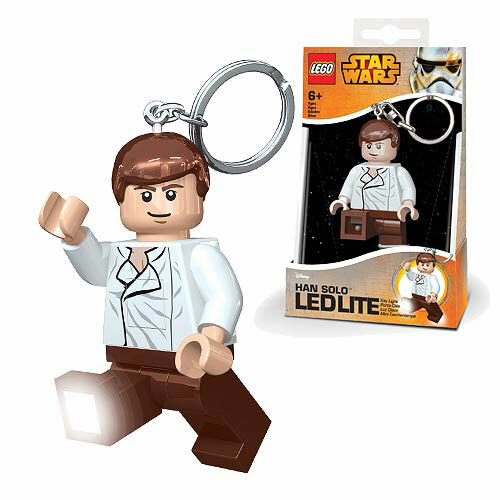 However, unlike the version of the character portrayed by Harrison Ford, this little guy has LED lights in his feet! Press the button in his tummy and both feet brightly shine, providing a really useful light for when you need it most. Great for finding the keyhole at night time, and also just cool to have for late night reading sessions under the covers. Who says it isn't nice to shoot your friends? It's fine when you're firing light at them, and if they've got a gun too. 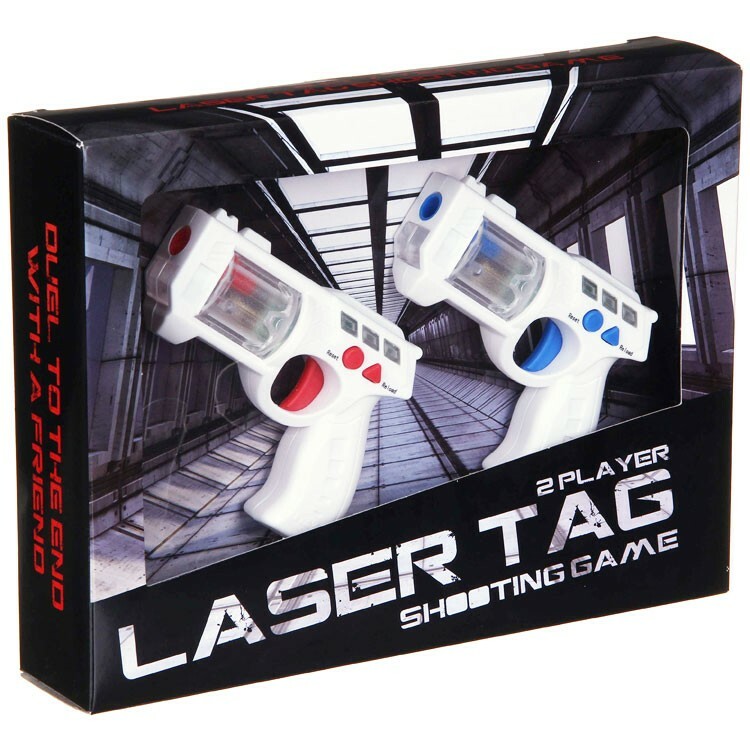 It's also pretty awesome to do so with the Laser Tag Shooting Game; something both you and the kids will love. Included in the set are two pint-sized pistols that are small enough to attach to your key chain (next to Han, above) yet large enough to be comfortably gripped by an adult. Shooters must face off, blasting the laser beam at their opponent's gun, on the front of which sits a small receiver. Each blaster has six lives, and the first to lose all six is dead. Each gun has easy to interpret LEDs, as well as easy to read instructions. Simply switch them on, and you're off! Tonnes of fun, we found it actually pretty tricky to hit your opponent's 'tag', meaning battles sometimes took a while. However, that all depends on how good a shot you are (we're all pretty bad), and how much of a coward your enemy is, therefore keeping his blaster well hidden (which we are). But the size is perfect for impromptu fights at both the home and office. Even as adult men, we of Test Pit Towers have always been unusual fans of In The Night Garden. If asked, we’d say we appreciate the Beckett-esque qualities of the Night Garden itself, coupled with the random and near-psychedelic nature of each episode’s narrative. But in reality, we’d really just like to hang out with Makka Pakka and take a ride on the Ninky Nonk. If you have little fans of such things, they’ll love the In The Night Garden Explore & Learn Musical Carousel. Each face of the carousel features a different character, including their signature phrases and song. There are also tactile activities on each side with plenty of things to pull out, press, and wiggle. Little ones will recognize the similar shape of the carousel from the close of each ITNG episode, while older fans will appreciate that not just Iggle Piggle gets the spotlight here. That guy is such a diva. We’re always banging on about how important it is to get lights on your bike at this time of year, but what about other forms of wheeled transport? 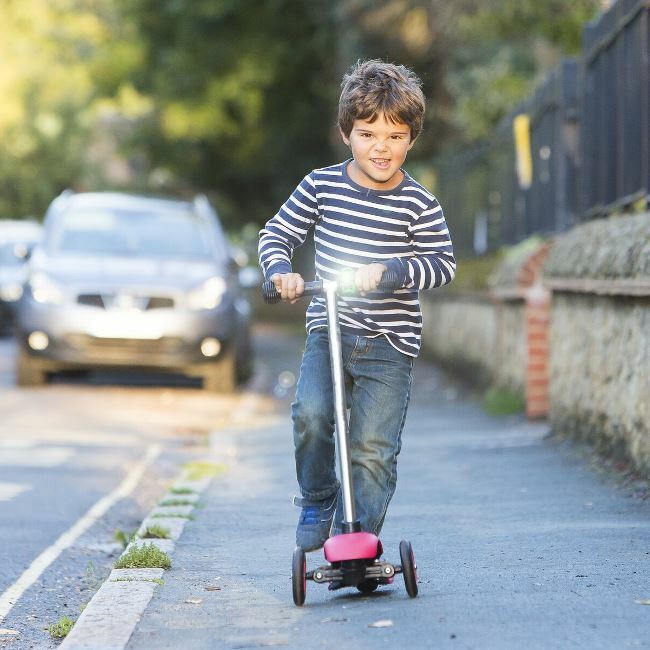 If your kids are getting a shiny new scooter for Christmas, then you’ll want to make sure they are as safe as houses while dashing around the winter streets. You need the Hippychick Scooti Light. 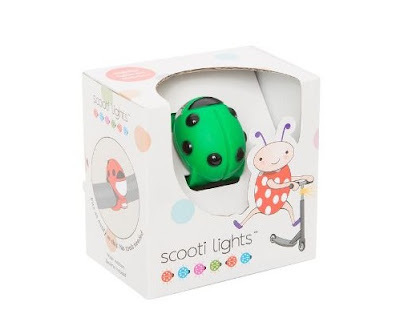 This fun looking package has been designed to clip onto the handle bars of a child’s scooter, shining a bright light ahead of your tiny wheel warrior. Shaped like a ladybird (in an array of colours) the light features three distinct flashing modes, all of which will ensure your kid will be seen by both cars and pedestrians as they tear up the asphalt. Or, you know, slowly scoot along to grandma’s house. We found it easy to install, easy for the kids to operate, and bright enough to be seen from quite a distance away. While the nights are long, this is a must-have. 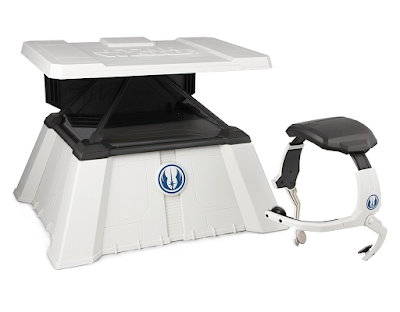 Another Star Wars product makes the final line-up, and this one is slightly more technical than a keylight. Force Trainer 2 uses some very clever technology to harness the power of your brain, letting you train your mind… LIKE A FREAKING JEDI, SON! 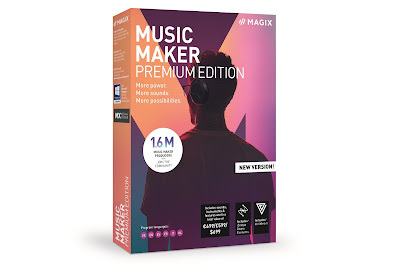 Basically, the player uses a Bluetooth-enabled headset which reads the brainwaves generated during moments of concentration. 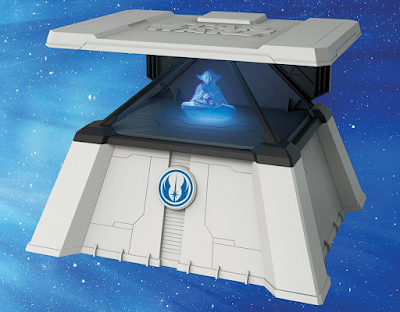 The more you concentrate, the more you can control the projected hologram in the base unit, and the further up the Jedi rankings you’ll progress. However, firts things first… you need a tablet, and preferably a large-screen model like an iPad or a 10-inch Android tablet. The headset then connects to the tablet which is running the Force Trainer app, while the base unit (which you have to assemble) uses an intricate array of reflective plastic surfaces to create the holographic images. The effect is pretty astounding, and the app is filled with real Star Wars sounds, music, and even an introduction by Yoda himself. By far the most striking hologram, and the one that will no doubt snag the interest of fans, is the X-Wing being raised out of the water. To actually lift it up we found that a strange kind of concentration was required, one more involved than simply looking at the hologram and willing it to rise. Some of us discovered that challenges were easier to complete when we visualised what we wanted to happen (or rather what we knew was supposed to happen as part of the simulation), producing an extremely weird sensation of watching happen what we’d seen in our minds. For others however (not just we at The Test Pit, but others we invited to try) different methods were apparently employed, such as speaking out loud what they wanted to happen, and even closing their eyes completely. Fortunately, there is a lot of value to this, as the challenges do get harder, and moving up a level feels like a real accomplishment. Essentially your money is going on the headset here, but the base unit is nicely modelled after the Jedi Temple and the app itself is a treat. Hours of fun, hours of Star Wars fun (more important), and an actual fascinating experience. Check it out.